﻿﻿﻿﻿﻿﻿﻿﻿Birding on the coast with experts proves transformational for two rookies. ﻿﻿﻿﻿Each spring, the upper Texas coast is transformed into a bird paradise. Birds from South and Central Amer­ica cross the Gulf of Mexico, flying north to cooler climates in a race for the best breeding sites in North America, and they stop here for rest and sustenance. The variety of species and sheer numbers of winged travelers are dazzling, if you know where to look. My brother-in-law Jamie Huffman and I were rookie birders, but we found a way to up our game. We brought along our own “ringer” — Texas Parks and Wildlife Department ornithologist Cliff Shackelford. During a three-day period, Cliff helped us identify 162 different species of birds in three counties: Galveston, Chambers and Jefferson. Jamie purchased the guided trip at a fundraising auction as a Christmas gift, but we had no idea what lay in store for us. Jamie is a San Angelo area rancher, and I am a dentist in Fort Worth, but for three days we left our day jobs behind and it was all about birds. By day, we traveled from woodlots to coastal marshes to ferries. By night, Cliff shared his restaurant expertise, guiding us to famous local Cajun restaurants and regaling us with local lore. Cliff, Jamie and I met in Port Arthur in mid-April, right in the middle of spring migration. We chatted a while, then went to bed early. Cliff told us that “the early bird gets the worm,” so we rose in the dark and headed out to the woodlots full of excitement and anticipated adventure. Woodlots contain oak trees planted more than 100 years ago as early settlers tried to tame the coastal plain. These tree oases, with their undergrowth of bushes and vines, offer the birds safe haven. 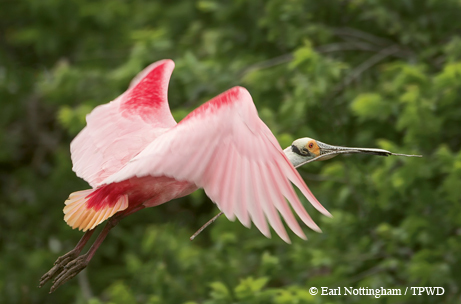 ﻿A roseate spoonbill takes flight at the Rookery at Smith Oaks. At the Rookery at Smith Oaks, just a few blocks away, we found roseate spoonbills, snowy and great egrets, neotropic cormorants and tricolored herons, nesting and raising young by the hundreds. Three to four nestlings per nest fight for room and food. They push, peck and dominate the weaker birds, which sometimes fall right out of the nest, to the delight of the alligators waiting below. It was a little painful to watch, but it also taught us a lesson about our own human spirit. We humans often rise above this basic survival urge and care for the younger and weaker among us. But I think the birds rise above us in that they give their all to mate and reproduce in order to propagate their species, while we can be more self-serving in our pursuits. At first, having driven through a neighborhood-type setting, I wasn’t sure if I needed to bring my camera with me. However, just inside the gate we were thrilled to realize that birds were everywhere. Needless to say, I ran back to the car and retrieved my camera. Cliff is a master who has perfected his craft. He helped us identify the species by their calls and songs, behavior, habitat and color. There was no end to his expertise in recognizing so many different species of birds. As they do in the tropical jungles of South and Central America, different birds adapt to different microhabitats in these woodlots. Some reside in the understory, like the hooded warbler with its bright yellow Lone Ranger mask and the ovenbird with its chicken-like bobbing. Some birds — like the summer, scarlet and western tanagers — congregate in the trees to feed on ripening mulberries and insects. We were surprised and pleased when Cliff told us that the western tanager was a rare sighting in this area. We witnessed summer tanagers dive-bombing a huge beehive and feeding on the bees as they fled. Above us were the birds of prey, broad-winged hawks and swallow-tailed kites. Each bird had its little part to play in this symphony of nature. Cliff knew them all like old friends, so he regaled us with stories about their lives, where they came from and where they were headed. 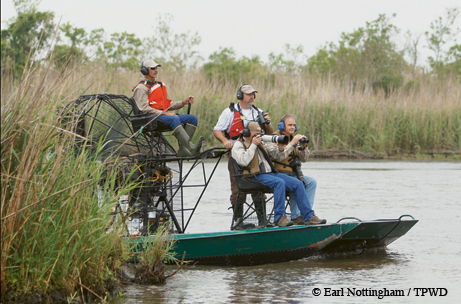 ﻿﻿The birders take an airboat ride at J.D. Murphree Wildlife Management Area near Port Arthur. By the end of the day, we were exhausted and starving, so we headed to Al-T’s in Winnie for a Cajun feast. We happened to bump into Cliff’s friends, Sid Gauthreaux and his wife, Carroll Belser. Both are world-renowned bird migration experts from Clemson University, so we listened in fascination as we enjoyed our crawfish etouffée. We headed for bed gratefully, as we faced another early alarm clock. Day Two found us exploring the J.D. Murphree Wildlife Management Area near Port Arthur. (The WMA was kind enough to let us use its bunkhouse as part of the auction package.) While Jamie and I had long since realized the blessing of having Cliff’s knowledge to guide us, this day brought another expert into the fold, WMA manager Jim Sutherlin. Our airboat driver, natural resource specialist Andrew Peters, carefully navigated the maze of marshland and alligators. Jim’s personal tour through much of the 25,000-acre wildlife area showed us the effects of the ebb and flow of nature. Jim described all the efforts made to preserve this special place. For us, it seemed to be alive with birds of all sorts. We saw black-necked stilts, blue-winged teal, stilt sandpipers and mottled ducks, among others. Jim reminded us that this was not their permanent home. “See those blue-winged teal?” Jim asked us. “They will all be gone in a few days as they migrate north to Canada.” He realizes and cherishes the transience of life here. Seeing it through his eyes made an impact on us. Leaving our fast-paced lives, it was the best medicine to just slow down and listen to the birds. We experienced firsthand the life-and-death struggle of these birds during their biannual migration. I was lifted up as we became witness to this unbelievable wonder of nature. For me, it was a spiritual cleansing that refreshed my inner being. “Nature’s peace will flow into you as sunshine flows into trees. The winds will blow their own freshness into you, and the storms their energy, while cares will drop off like autumn leaves,” John Muir wrote in Our National Parks in 1901. After a day filled with wonders, it was time to feed our inner beasts, and once again, Cliff knew just where to go. In nearby Nederland, a restaurant called Sartin’s Seafood offered crab balls and barbecued crabs so good that they practically took my breath away. Full and satisfied, we headed back to our bunkhouse quite exhausted. 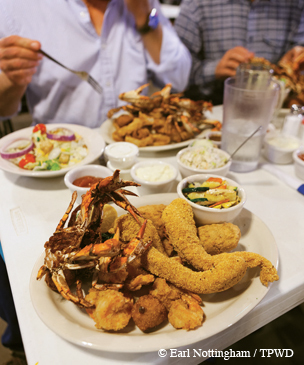 ﻿﻿﻿The seafood is piled high at Sartin's in Nederland. Day Three found us on a driving tour of Anahuac National Wildlife Refuge, which was hit hard by Hurricane Ike and was left under 10 feet of salt water for days. This refuge is within easy driving of Houston and provides a great escape into nature. These wild places allow us all to see nature “in the raw.” We saw least bitterns and purple gallinules. From there, we headed to Bolivar Flats, just east of the Galveston Jetty in Galveston County. This coastal site has easy access for birders. We were awestruck at the sight of more than 10,000 American avocets — a good chunk of the world’s population — in one place. They fed in unison, moving back and forth as a single body, like prairie grass blowing in the wind. It was as if they danced to a primal beat we couldn’t hear. Though there was still evidence of damage from Hurricane Ike, the birds didn’t seem to mind a bit. Cliff wanted to take us to Galveston for a last meal, but there was birding along the way as well. He told us that ferries are actually great bird-watching spots, and the dolphins were a bonus. Our last meal together was at Benno’s on the Beach on Seawall Boulevard in Galveston. We gorged on heaps of boiled crayfish, those delicious “miniature lobsters.” These stops to eat were not just gastronomic pleasures for us. With all the birders in town, the talk was all about birds — who had seen what, and where. Although we were rookies, we felt welcome when hanging around with birders from all over the world. They were armed with all kinds of equipment, everything from camouflaged bazooka-like telephoto lenses to small pocket cameras. Our conversations were peppered with “Did you see that blackburnian warbler?” or “Have you seen a swallow-tailed kite yet?” They were interested in us and seemed to enjoy sharing their finds as well. Transformed by our days with Cliff, we found ourselves feeling comfortable among kindred spirits. We share with them the desire to not only experience nature, but also to preserve it for future generations to enjoy. 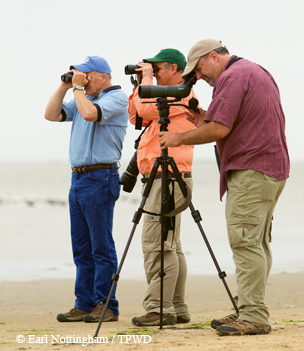 Cliff Shackelford helps Jamie Huffman and Amos Ross spot birds at Bolivar Peninsula.